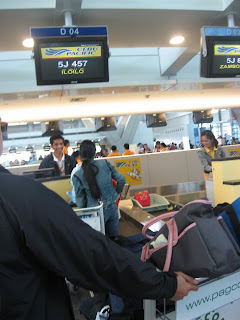 January 15, we headed to the new airport to catch the Cebu Pacific flight 5J 457 bound for Iloilo. It's our first time to be in this airport so it was a new experience. The facilities are okay and way much better than the old domestic airport which I found so 'bulok'. Tagging along was our dear Yaya Cat. This is like her annual leave. 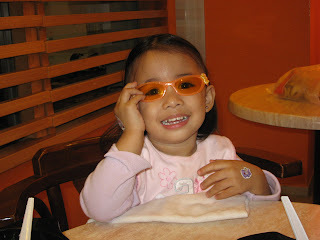 The plan is for her to take a short vacation in Maasin, Iloilo where her family lives. She will go home the same day we arrive and return na on our departure date. She deserves this vacation because she has worked very hard for the past year. Being more than 2 years old, Zoe already has seat of her own. Good thing she's well adept with the seatbelt for she loves to toy with the seatbelt of her stroller and in the car. 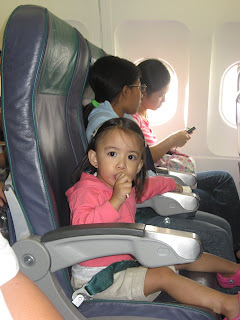 We gave her a lollipop to keep her busy during the take off. It really worked. 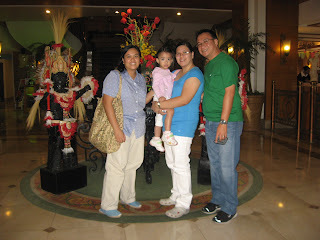 We arrived in Iloilo before dawn and headed straight to Sarabia Manor Hotel. We're so glad our friend Det was kind enough to send her driver to pick us up in the airport and bring us to the hotel. Cat was able to get a taxi na rin agad to go to Maasin. My sister met us as soon as we got to the hotel. Her house is just a stone's throw away from Sarabia. We decided to have dinner in Bourbon Street in Smallville which is like the Eastwood City of Iloilo. The ribs in Bourbon Street tasted great! I woke up early to catch the 6am mass at my sister's place. After mass, I walked back to the hotel to eat breakfast (the buffet in Sarabia is good) and to bathe Zoe. After that, we went to pick up my sister who still went to work (school). She still had 1 class for the day. 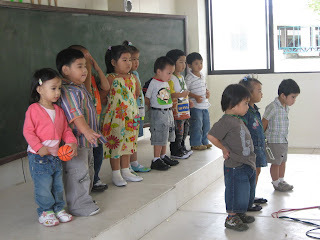 While in St. Joseph's School, we saw a group of nursery kids lining up for class. My sister's co-teachers allowed us to look into the class. 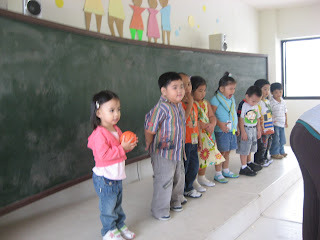 Zoe ended up being "saling ketket", lining with the rest of the kids and even standing infront of the class mimicking the actions that the teacher was doing (it was for their poetry presentation). When they started singing Incy-Wincy Spider (did I spell it right? ), her eyes beamed with happiness and she screamed in delight! She must really like school (a good sign!). The other kids are also oh so cute! Many of them are about a year older than Zoe. 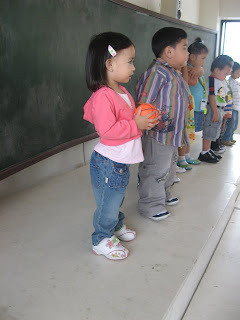 Look at Zoe here -- sinisiksik yung cute boy. Hahaha. After going to St. Joseph's School, we headed for the pier to catch a boat ride to Bacolod. We took the Weesam Express which costs about P370 per person (1st class). The ride was kind of bumpy because it was windy but it's okay. When we got there, we immediately contracted a taxi to take us around the city (P1,000 for the whole day na). Our first stop was at Pendy's for lunch. The food was great! We had Kansi, Pendy's Fried Chicken and Pancit. After that, we went to The Negros Museum (fee is P50 each). There we had a guided tour by a very nice lady (I think Debbie's her name) who relayed to us the history of Negros and the province's sugar industry. There was also a great collection different dolls by the Montelibano's, known to be the vastest collection in the country. Zoe really enjoyed looking at this one. Too bad, we were not allowed to take pictures inside. 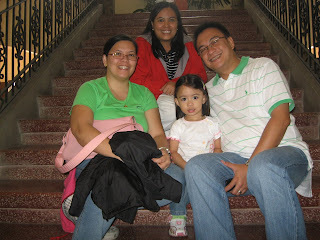 Here are just some pictures of us sitting on the old staircase of the museum. The museum used to be an old government building which was constructed around 1941. Next stop was at the Negros Showroom which is actually a store for souvenirs and Negros / Bacolod food products. I bought some Muscovado sugar there and some Bacolod ref magnets. For merienda, we made our way to the famous Calea, near L' Fisher Hotel in Lacson Avenue. They serve the best cakes and pies in town. I swear, the pies that we ate were super yum-O! I really wished I bought a whole box for take-out. I regret now that we didn't, because now I'm craving for one! 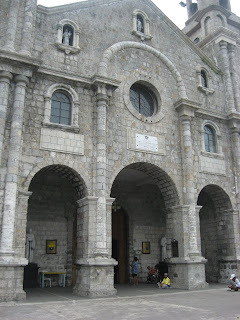 Last main stop was at the San Sebastian Cathedral. Just passed by the Bong Bong's Pasalubong store to buy piaya and other stuff and then headed at around 5 p.m. to the pier to catch the last trip going back to Iloilo. 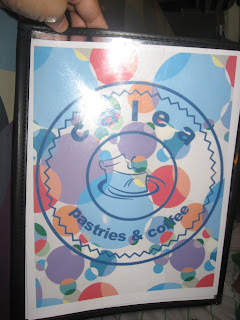 When we got back to Iloilo City, we went to Esca's for dinner. Tiring day but super fun! The third day is for a tour around the city. Photo opps first before leaving the hotel. The hotel already had several tourists because it was the start of a week-long Dinagyang Festival, wherein the culmination is held every 4th Sunday of January. This festival is dedicated to Señor Sto. Niño. The dance competition is really something to look forward to! Our first stop for the day was the Jaro Cathedral to pay homage to Our Lady of Candelaria whose image is said to miraculously 'grow' each year. 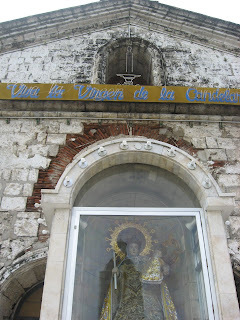 In the picture below, the hole on top is the actual place where the statue of our Lady was originally placed. Now, she is more than double the size of her small niche. 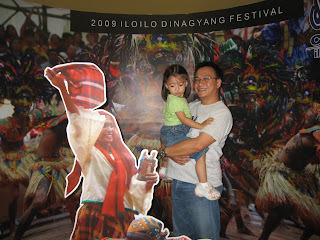 Her feast is every February 02, almost a week after the Dinagyang Festival. A tablet near the statue said that Pope John Paul II himself went to this church back in 1981 and addressed the people from the top of the balcony where Hubby and Zoe are standing in the picture. Just across the cathedral is the main branch (I think) of Biscocho Haus. We bought several delicacies there. 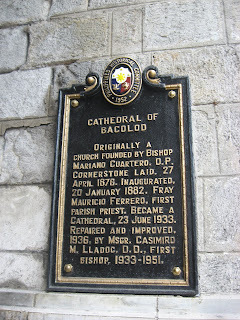 Then we headed for Mary Mart near SM Delgado. What's there? Ukay-ukay!!!! Yeah, I traveled all the way to Iloilo to shop for some ukay-ukay. Hahaha. My sister and I love ukay-ukay. And what I really like about this ukay-ukay is that the clothes are arranged according to color. In that way, we can easily choose which colors you prefer. In a matter of minutes, I scored some nice maternity-styled tops which were in really good shape pa. :-) Only for 100 bucks each. 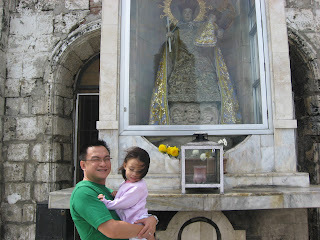 After that, Hubby, Zoe and I went to noontime mass in the nearby air-conditioned Sto. Niño Chapel just beside SM Delgado. After mass, we were off to Tatoy's for lunch. We had lechon, liempo, oysters, shrimps and sinigang na lapu-lapu. It was heavenly ~ need I say more? We were so tired from the day's tour that we decided to just stay inside the hotel to rest. Anyway, for dinner, we met up with our friends from Metrobank and they treated us at Krua Thai (yummy again) in Smallville. It was so much fun seeing and talking to our friends. Det, My (with son Ralph) and Philip ~ we really enjoyed your company. Our last day was dedicated to shopping and packing. Yaya Cat met us in SM City that morning where we also had Ted's Batchoy for brunch. 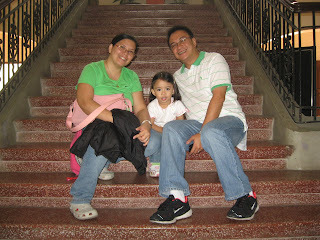 At noon, we attended Sunday mass at the Jaro Cathedral. Lunch was at Mang Inasal near Mary Mart. And then it was pasalubong shopping again in Deco's Pasalubong Shop near SM Delgado. We bought a box-full of goodies to take home to our family and friends. At around 5:30 pm, we were already on our way to the airport. We just had a simple dinner in JD Bakery inside the airport before boarding. 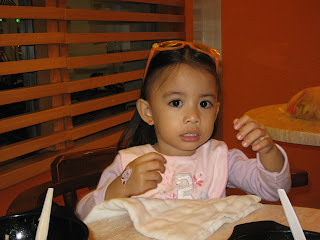 We kept Zoe busy and sitting down by opening a tumbler of Chef Tony's Popcorn (our baon). Bye-bye Iloilo! We enjoyed visiting! 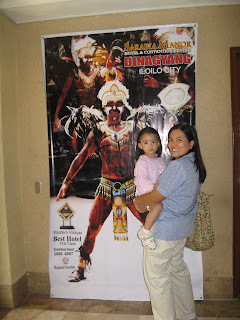 I visited also Iloilo and stayed in Iloilo hotels, their accommodation are satisfaction.